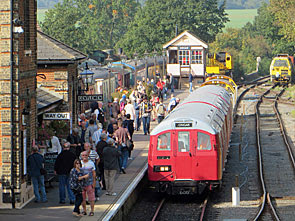 20 years ago tomorrow, the last tube train ran between Epping and Ongar. The last that is until this weekend, when the very same train returned to the very same line and transported many more people than it ever used to do back in 1994. So that was a grand day out. The railway opened with high hopes, and longer ago than you might think. Ongar was first served in 1865 when the Great Eastern Railway extended their Stratford-Loughton branch deeper into the rural heart of south Essex. Their station at Epping did well, but the line was always single track through the fields beyond and passenger numbers never really took off. 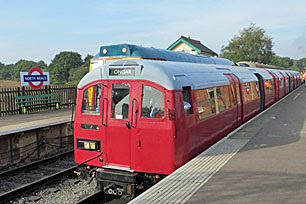 London Transport took over in 1949, running only a shuttle service between Epping and Ongar, initially with steam, then later with electrification. The Green Belt prevented major housing development and kept patronage low, and with no more than 650 passengers daily the line became ripe for termination. LT tried in 1980 but succeeded only in cutting the service to peak hours only, and closed an intermediate station the following year. The end came on 30th September 1994, when of course miraculous numbers of passengers turned out, and for the next ten years the line fell silent. Volunteers then began the long job of restoring the line to steam, culminating in a grand reopening in 2012, though still not quite the full line. 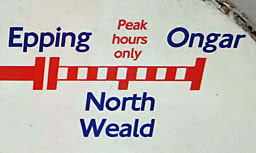 At present westbound trains terminate in woods at Coopersale, but there are plans to extend to almost-Epping to facilitate interchange with the Central line. End of potted history. It's not in any way simple to restore tube trains to an ex-tube line. For a start the carriages have to be preserved, as these three have been by the Cravens Heritage Trains trust. The end two date to 1960, while the middle carriage is much older 1938 stock, and has comfier seating to boot. But the biggest problem is that the line's no longer electrified so the trains don't actually work, hence a bit of mechanical sleight of hand was called for. Two Schoma Diesel locomotives were brought in to shunt the three carriages down the line, and then when they proved slightly unreliable their number was doubled up to four. Viewed from outside, from one end of the train, the combination looked most peculiar. But viewed from the front it appeared that the trains were motoring under their own power, just as they would have done 20 years ago. And for those of us sat inside the illusion was complete, so it really did feel like we were speeding through the countryside on a proper tube train. One other catch, obvious if you think about it, is that the sliding doors didn't work. A member of Epping Ongar Railway staff had to come along and flick an external lever to close the doors mechanically, and even then they often needed an extra tug from one of the volunteers within. Ditto at the end of the ride we had to wait to be let out, and even then only via one set of doors per carriage. Generally that was fine, as we didn't mind being trapped in a carriage decked out with adverts circa 1994 (for Travelcard extension tickets and Oranjeboom lager, amongst others). But by the end of the day the carriages were masquerading as mobile greenhouses, in part thanks to the unseasonably warm weather but also due to the increasing numbers of passengers within. Those who turned up for the first train of the day faced mostly empty seats, but by mid-afternoon it was standing room only - unheard of on the Ongar line! They came in great numbers, the trainkeen. You could tell most by their enthusiasm, and by their sharp-lensed cameras for the recording of the day. People stood nicely to give everyone their turn to photograph a train, and engine, whatever, or at least they did for most of the time. Ladies were very definitely in the minority, and girls under 18 almost non-existent... unlike their extremely trainkeen brothers. Many had made the effort to come despite not being in the prime of health, and hats off to the young gentleman in a wheelchair for enduring what was very much not a step-free service. A really nice touch was that the usual station names had been replaced by roundels. The cover-up was only for this weekend, and occasionally you could see the paper flapping off, but the overall effect was highly realistic as if these were the enamel signs that had always been present. Up at Ongar another special sign had been added, indeed unveiled by the Managing Director of London Underground, showing the 0.0km point from which all distances on the network are still measured. And Met 1, the Underground's new pet steam locomotive turned up to run a few of the journeys down the line. She looked magnificent in her polished Metropolitan maroon, but alas she performed less convincingly and broke down (with injector issues) before the first of the day's designated round trips was complete. That buggered the planned timetable somewhat, with a diesel brought in to run the steam service, and later replacing the proper tube service too. But End of Tube was a splendid event all told, possibly unrepeatable, and much enjoyed by the crowds who turned up. I could write more but I've chosen to illustrate the day via 50 photographs you can click through and view. I'll have more to tell tomorrow about what was going on elsewhere, but for now let me applaud the teamwork and organisation that bought electric trains to a non-electric line. And the best bit of the day was the repeated realisation, speeding through the woods, trees or fields, that I was actually on a tube train shuttling between Epping and Ongar. Never thought I'd see the day again.